Promotion Details - Mix and Match 2+ any Bethyl products on the same PO and save 20% on each..
Cedarlane›Promotions› Mix and Match 2+ any Bethyl products on the same PO and save 20% on each.. Mix and Match 2+ any Bethyl products on the same PO and save 20% on each.. Mix and Match with Cedarlane and Bethyl Laboratories! Buy any 2+ Bethyl Products and Save 20% on Each Product! Bethyl Laboratories Inc. has been consistently dedicated to supporting scientific discovery through its qualified antibody products and custom antibody services since its founding in 1972. Every antibody that Bethyl provides has been manufactured to exacting standards at its sole location in Montgomery, Texas, and has been validated in-house by Bethyl’s team of experienced scientists. ELISA Sets - Affinity purified antibody, calibrator and HRP conjugate are packaged to provide a quantitative ELISA set. Each set contains reagents sufficient for 1000 single well assays. Sets do not include plates, buffers or substrate. If these components are not readily available in your lab, you may want to order an ELISA Starter Accessory Kit, Catalog No. E101 or Catalog No. E103. 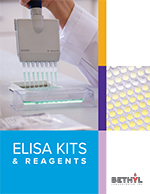 ELISA Kits - Kits include pre-coated 96-well strip plate, standard, detection antibody, sample dilution buffer, HRP solution, TMB substrate, stop solution, 20X wash buffer, sealing tape and detailed instructions. Species include: Bovine, Cat, Chicken, Dog, Goat, Horse, Human, Mouse, Pig, Rabbit, and Rat.